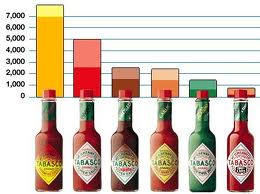 TABASCO is the brand name that most likely kick started the whole concept of hot sauces. First produced back in 1868 by Edmund McIlhenny, TABASCO is now produced by US-based McIlhenny Company of Avery Island, Louisiana. TABASCO got it’s name from the Tabasco chili peppers that were used as the staple ingredient. The original TABASCO sauce is made from only 3 ingredients; tabasco chili peppers, vinegar and salt. The McIlhenny Company is now a fifth generation family business, of which all the shareholders either inherited their stock or were given stock by a living family member. The small TABASCO hot sauce bottles are as legendary as the hot sauces themselves. Story has it that McIlhenney originally used discarded cologne bottles to package the hot sauce blends. When he began to sell the TABASCO hot sauces commercially, he continued with the trend and ordered thousands of cologne bottles, and thus the TABASCO as we know it today was born. TABASCO now has 7 hot sauce products, all of varying degrees of heat. The latest product is the TABASCO Buffalo which was added to their product line in 2011. Below are the TABASCO® Brand Products.